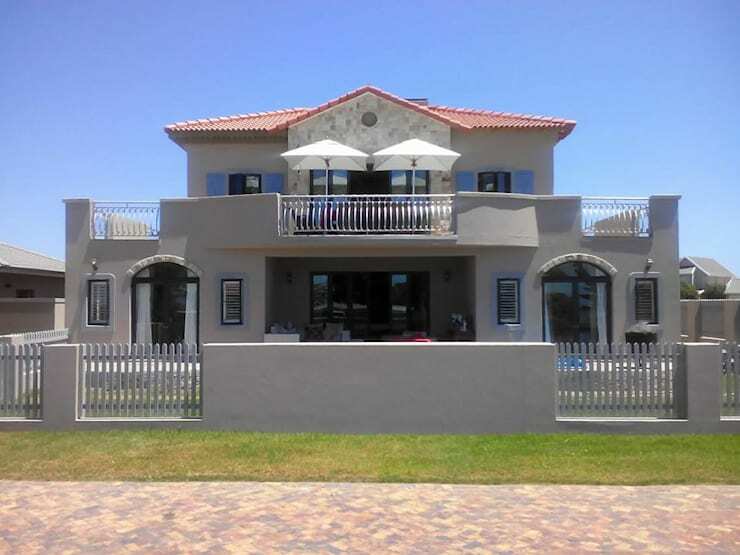 Rudman Visagie are architect professionals in Mossel Bay who are experts when it comes to detailed designs that bring life and soul to family homes. Today we are going to explore a gorgeous home that is as charming as it is comfortable. With Tuscan touches and a modern edge, this space will teach us how we too can add a sense of homeliness and sophistication to our very own homes. If we look at the home from the outside, we can see how modern and charming it is, with its beige facade, blue shutters and stone touches. The stone facade at the top of the house as well as the stone arches that frame the arches bring a rustic touch to the space, while making it look grand and gorgeous. The blue shutters add some colour and personality. From this angle, we can see that size is not an issue for these designers. They've created a home that spreads over two stories and expands out into a large garden. This has allowed them to create a few outdoor spaces as well, including large patios and balconies, where the family can enjoy the sunshine and fresh air without giving up the comfort of the living spaces. If we head inside the kitchen, we can see how industrial chic it is! The screed flooring sets the scene for a very large and open plan kitchen, which is enhanced by the grey tones throughout. 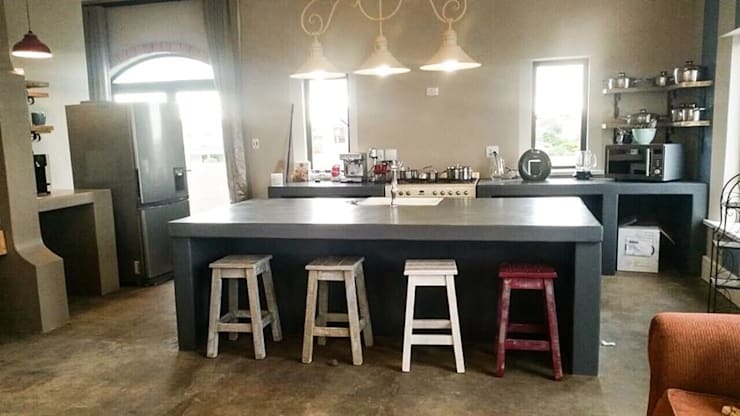 The star of the kitchen is the grey kitchen island, which is flanked by the colourful bar stools. This creates a more casual space for the family to sit and enjoy each other's company over a cup of tea or a bowl of cereal. The colourful bar stools break up the grey tones. Have a look at these 7 sensational kitchen islands for inspiration for your own home. Three lamps drop down from the ceiling, providing light to the kitchen, without disturbing the ambiance or atmosphere. Natural light also streams in throughout this space, creating a gorgeous, warm and homely space. If we head into the living room, we get a sense of cosiness and homeliness. For starters, it features a pizza oven! Can't you imagine family nights making pizzas, curling up on the sofas and playing games? 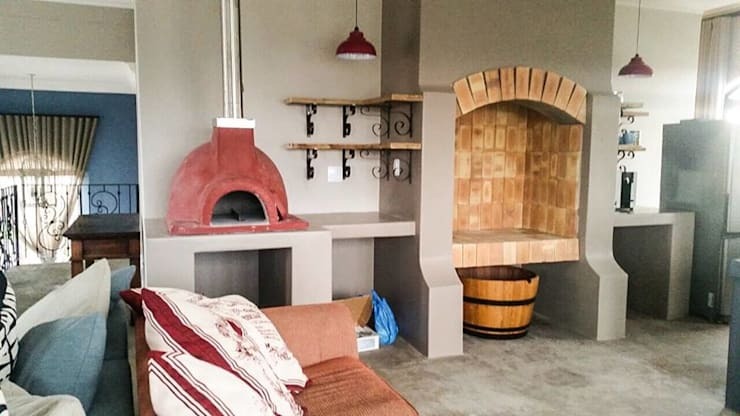 The pizza oven adds to the industrial look and feel, but introduces some colour to the space. There is also a fireplace, where the family can burn wood in the cooler winter months. This contributes to the ambiance and soul of this space. The stone also breaks up the grey used throughout the space. We can also see that the designers have gone for red tones when it comes to the sofas and cushions, which introduces some more colour and charm to the space. Don't be afraid to add a touch of colour to your home! If we head into the entrance hall, we can see how a red sofa next to the staircase also adds a bit of colour and charm to an otherwise wasted corner. It also introduces some luxury and elegance to the space. This works in harmony with the beautiful chandelier that hangs from the ceiling. When it comes to the staircase, although its a functional element in the home, it can also double up as a design element. 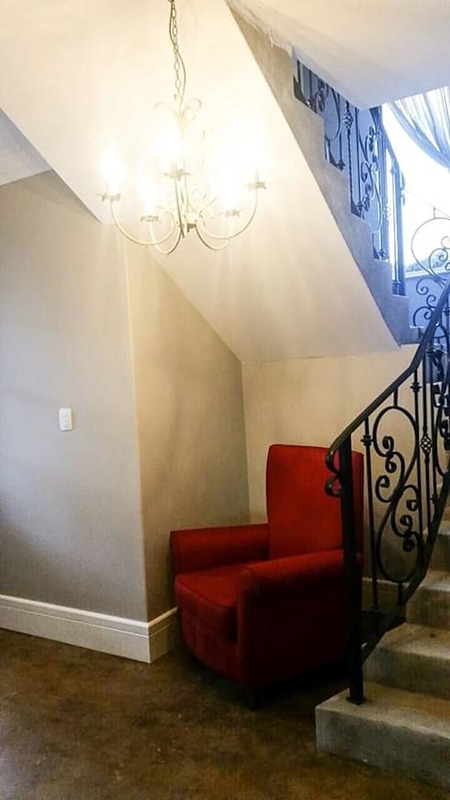 In this image, we can see how the designers have added a detailed wrought-iron banister to the staircase. This is a beautiful design element that adds a gorgeous design element to the space. If we look at the home again from the outside in the evening, we can see what a big role lighting plays. The exterior lighting truly enhances the exterior of the home, illuminating the stone details and the beautiful additions here and there. 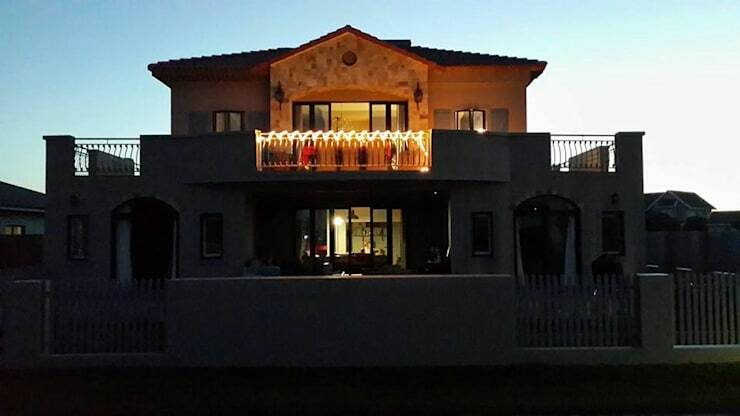 Outdoor lighting also allows a family to make the most of a family home, even after sunset. Imagine playing night time cricket with the kids or hosting a pool party, thanks to strategically placed outdoor lighting. This home is grand yet comfortable, elegant yet functional and beautiful yet homely. Wouldn't you feel a little bit like a princess living here?